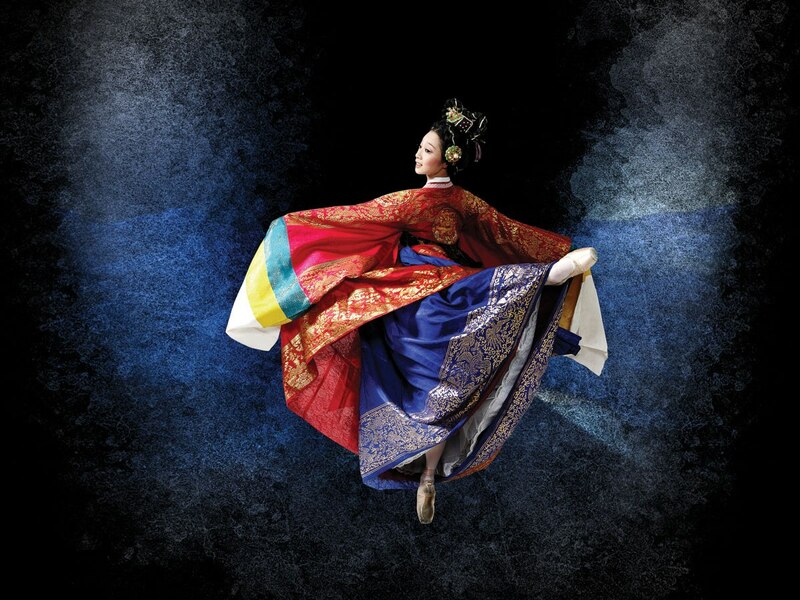 Shim Chung was performed by Universal Ballet Of Korea. Last night the girls and I went to watch the Ballet Shim Chung…. What can I say?… This ballet took my breath away!!! It is hands down THE BEST ballet I have ever seen! It had a new level of performance blending traditional sentiment and modern artistry into one. The main story line is about Shim Chung’s devotion to her blind father and how heaven is moved to restore his eyesight. * The underwater video scenes were out of this world!… it was unexpected and felt like a treat! * Shim Chung and her father reuniting was one of the most touching scenes I have seen in a ballet! * The fantasy undersea kingdom in Act 2 was a visual feast. * The costumes were very beautiful and so was the design set. The curtain opens revealing the old, thatched cottage of Shim Hak-Kyu, the blind man. He is eagerly awaiting the birth of his first child. His new baby daughter Shim Chung is brought to him, but his joy soon turns to sorrow when the midwife informs him that his wife is dead. In the years that follow, the blind father supports his daughter by begging until Shim Chung herself takes over. The village seems to feel responsible for her, and they give generously. One day, however, Shim Chung is so late returning home that her distraught father goes out in search of her. On his way to the village, he stumbles near the bridge and falls into the river. He is rescued by a Buddhist monk who tells him that he can regain his sight if he donates 300 sacks of rice to the temple. The father eagerly pledges the rice, only to regret his decision later when he remembers how poor he is. Shim Chung finally arrives home, and the worried father tells her what he has done. She reasures him not to worry, but is deeply concerned herself. Soon a Captain of a ship and his sailors come to the village and offer a large sum of money for a maiden to be sacrificed to the Sea Dragon King during their voyage, to protect the ship from the sea. Shim Chung shocks the Captain by volunteering herself in order to fulfill her father’s pledge to the monk. She receives the money from the Captain, gives it to the monk, and begs him to purchase the 300 bags of rice and to pray for her father to regain his sight. Her father and the whole village weep bitterly when she departs with the Captain and his sailors. The Captain and his men take Shim Chung back to their ship. Three drunken sailors pursue Shim Chung and attack her, but the Captain stops and scolds them. He reminds them that if the seas become rough, she will be sacrificed, and he gives Shim Chung the white sacrificial dress. The Captain and his men rejoice when Shim Chung takes the dress and accepts her fate. Later she finds a place on the deck to rest as evening falls. Night comes and she falls asleep. In a dream, the spirit of her father comes to comfort and strengthen her. Before the first rays of dawn, a storm breaks and wrecks the ship. Shim Chung prays and jumps into the sea. After Shim Chung is found unconscious in the ocean , she is rescued and presented to the Sea Dragon King. He already knows about her voluntary sacrifice and has proclaimed her as great Daughter. As soon as she appears, the King is struck by her beauty, and he offers her gifts and invites her to join his son the Prince and celebrate with the creatures of the deep. A court entertainment is presented in Shim Chung’s honor, and Shim Chung wins the hearts of the entire court. But she seems troubled by something. The Sea Dragon King asks what she desires, and she explains that she is worried about her blind father, whom she left behind. The King tells her that any father’s heart would be moved by devotion such as hers, and agrees to let her return to the surface in a huge pink lotus flower. The Korean King and his ministers are gathered in the courtyard in front of a pond full of lotus flowers. It is time for the Korean King to marry, and the court ministers have been searching high and low to find just the right bride for him. Several candidates have been brought and presented to the King, but none of them seems just right. Suddenly, as if by magic, a pink lotus flower appears in the palace garden. It opens, and a beautiful maiden steps out of the flower. The King asks her who she is and where she has come from. Shim Chung introduces herself, and explains that she is trying to find her blind father. The King offers to help, ordering his ministers to search the country and bring all the blind men to the palace. He invites Shim Chung into his palace to rest after her long voyage. In the evening, Shim Chung hears music from the courtyard that reminds her of her childhood, and her father. She comes out to the veranda to listen more closely. Watching her, the King is moved by her pure heart and her beauty. As time passes, the King love for Shim Chung deepens, and he directs his court to make all the preparations for a royal wedding ceremony. As the day of the ceremony arrives, the blind men begin to arrive from around the country. The new Queen meets each of them, only to be disappointed over and over. Her father is not among them. She is about to withdraw into the palace when one last blind man taps his way into the courtyard. When she turns toward him, his back is to her. Although afraid of being disappointed again, Shim Chung approaches him and turns him around. It is her father! At first he cannot believe that his beloved Shim Chung is alive, and he rejects the weeping Queen. After touching her face, however, he realizes it is truly Shim Chung. Overwhelmed with joy, he regains his sight. The court rejoices at the miraculous reunion and as the royal family greet people, the other blind men receive their sight as well. The King and Queen celebrate the wondrous occasion, Shim Chung father offers his blessing on her marriage, and all share in their joy. 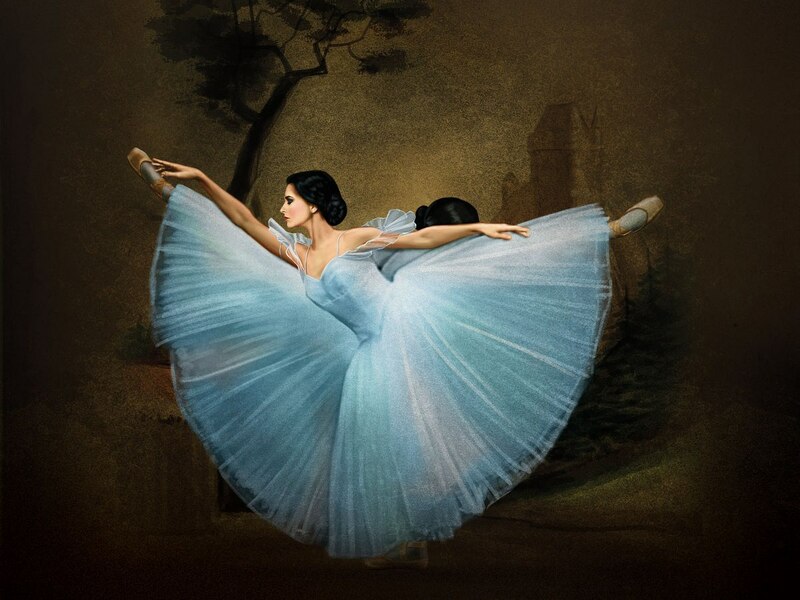 Anyways last night La Scalla Ballet Group preformed Giselle in Muscat…. It was beautiful….. what a performance? !….The girls and I enjoyed it very much!. Giselle is a ballet in two acts ….. The ballet tells the story of a peasant girl named Giselle whose ghost, after her premature death, protects her lover from the vengeance of a group of evil female spirits called Wilis!!!! The ballet is set in Rhineland (Germany) in the Middle Ages during the grape harvest. Giselle was this beautiful young peasant maiden….. Like many beautiful maidens Giselle had a lot of admirers. One of them was Hilarion, a forest-ranger or game-keeper, who had loved her deeply for a long time and was hoping that she would fall in love with him. The handsome young Duke Albrecht, whose Castle overlooked the village; was also desperately in love with her even though he was already betrothed to the Princess Bathilde of Courland, whom he was expected to marry. The Duke devised a plan of action with the help of his favourite attendant, a young squire named Wilfred. He used the empty cottage which was opposite Giselle’s cottage. Here he would arrive secretly and hide his fine clothes as a young lord; and would dress as a peasant. So he introduces himself to Giselle …….and Giselle all too quickly falls in love with him! The lovers meet many times…… Hilarion, the game-keeper becomes furiously jealous whenever he sees Giselle with that stranger!! !….he warns her against trusting the stranger, but Giselle refuses to listen. Albrecht and Giselle dance a love duet, with Giselle picking the petals from a daisy to divine her lover’s sincerity. The couple is interrupted by Giselle’s mother, who, worried about her daughter’s fragile health, ushers the girl into the cottage. Horns are heard in the distance and Loys retreats from the scene. A hunting party enters and refreshments are served. Among the hunters are Princess Bathilde and her father. Giselle returns to the scene, dances for the party, and receives a necklace from Bathilde. When the party departs, the Duke reappears (in his disguise as a peasant) with the grape harvesters. A celebration begins. Giselle and the harvesters dance but the celebration is brought to a halt by Hilarion who, having investigated the Duke’s cottage found the nobleman’s horn and sword. The horn is sounded, and the hunting party returns. The truth about the Duke Albrecht is learned and Giselle goes mad and dies. Although Giselle takes Albrecht’s sword, her death is actually a result of her weak heart. Act is set in a moonlit glade near Giselle’s grave. Hilarion is grieving Giselle’s death. He is frightened from the glade by the Wilis, female spirits who rise from their graves at night and seek revenge upon men by dancing them to death. Giselle is summoned from her grave and welcomed by the supernatural creatures who then quickly disappear. Albrecht enters searching for Giselle’s grave, and she appears before him. He begs forgiveness. Giselle, her love undiminished, readily forgives him and the two dance. The scene ends with Albrecht in pursuit of Giselle as she disappears into the forest. Hilarion enters pursued by the Wilis who threw him to his death in a nearby lake. The Wilis then surround Albrecht and sentence him to death as well. He begs to be spared but the Queen of the Wilis refuses. Giselle protects him from the Wilis when they force him to dance. Sun rises and so the Wilis go back to their graves, but Giselle’s love has saved Albrecht. By not surrendering her self to feelings of vengeance and hatred that define the Wilis, Giselle is freed from any association with them, and returns to her grave to rest in peace. The people’s diva and celebrated soprano, Renée Fleming & Royal Philharmonic Orchestra conducted by the dynamic Joanna Carneiro preformed tonight at the Royal Opera House Muscat…. we really did enjoy the performance. So glad we went even though we were all exhausted from last night !! !